1888 was a very good year for Lancaster printers. Fifteen print shops were running full-steam ahead, employing dozens of type setters and pressmen. Business was booming. 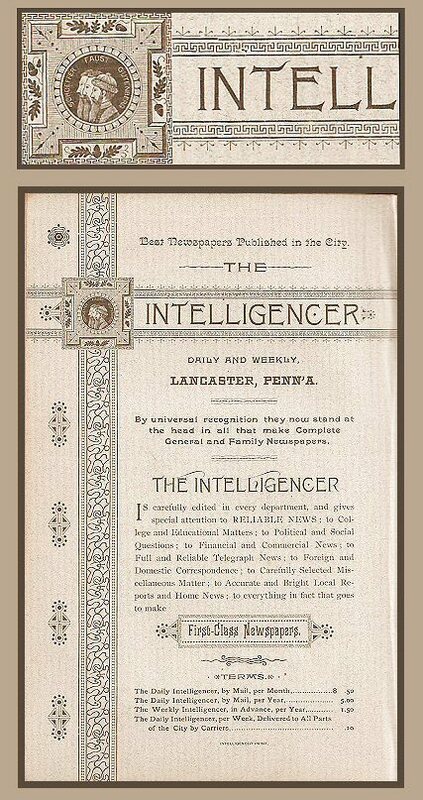 The print shop with the deepest roots and the earliest history, here in Lancaster County, was (and still is) the "Intelligencer Printing House," which continues today as Intelligencer Printing, one of the premier East-Coast printing companies. 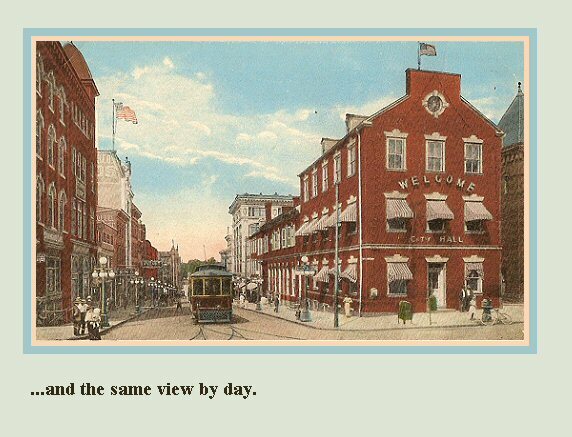 The story of Intell Printing begins in the 1790s with William Hamilton and the Dickson Brothers, whose stories are Here (Hamilton) and Here (Dickson) The story continues into the mid 1800s with John Forney Here. Another banner year for the Intelligencer printing shop and its Intelligencer newspaper is 1866, the year Andrew Jackson Steinman purchased this company. The Steinman family continues ownership, today, of The Intelligencer Journal and Intelligencer Printing. Steinman was a Yale-educated attorney and businessman. 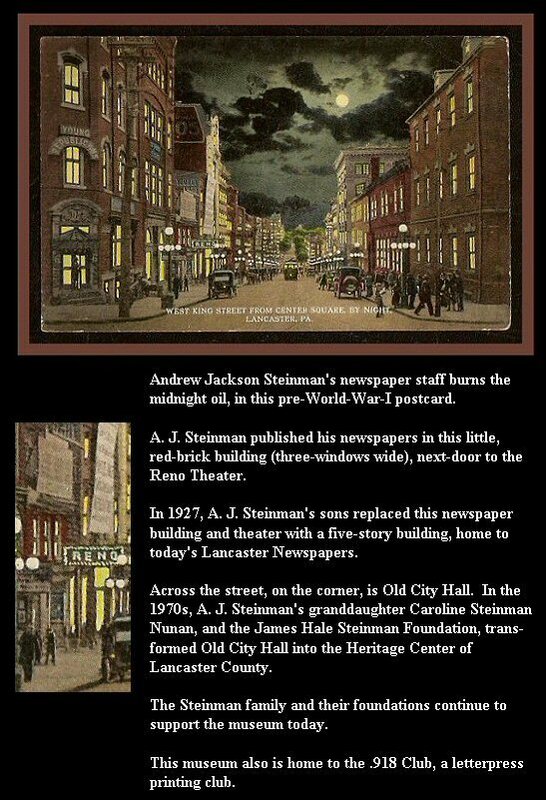 Unlink some of those other powerful personalities in Intelligencer history, Steinman did not begin his newspaper career as a printer. Politics enticed him into the business. A. J. Steinman and his descendants carried forward these newpaper and printing businesses into the 21st century, where their enterprises flourish today, as cornerstones of Lancaster history. This 1888 Intelligencer features a vignette of the three German godfathers of letterpress printing: Johann Gutenberg, Johann Fust (or Johann Faust), and Peter Schoeffer. This triple portrait feels like a nod to the German ancestry of the newspaper's co-publisher at that time, Andrew Jackson Steinman. His great-grandparents emigrated here from Germany in the 1700s, as Moravian missionaries; Christian Frederick Steinman was born in Dresden, and Anna Regina Rosin Steinman was born in Erfurt. Above: The Intelligencer Journal newspaper nameplate (or masthead) in 2007. So, what exactly is this blackletter Intelligencer font? Is it Old English? Is it Germanic fraktur? Is it both? 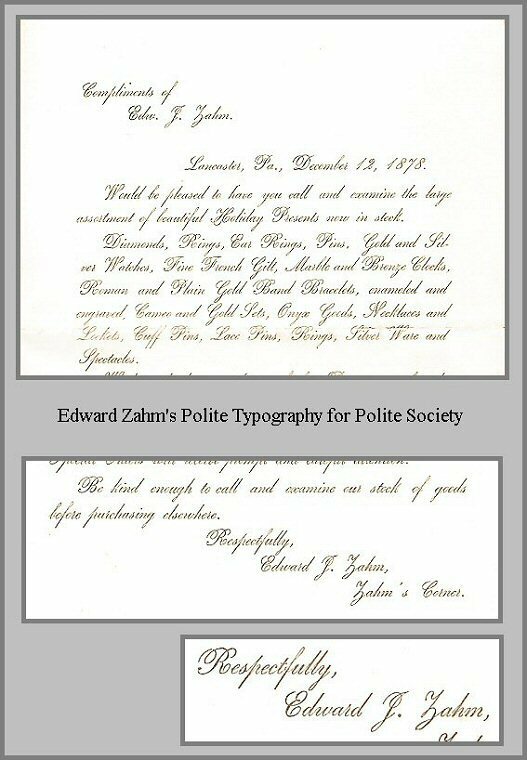 I define fraktur as the Germans do, since they are the ones who perfected it, thanks to Gutenberg and all. According to the German type classification, all "broken types" are fraktur, and can be subdivided into four fraktur subgroups: gotisch (textura), rundgotisch (rotunda), schwabacher, and the subgroup fraktur (post-Renaissance). I don't know if this Intelligencer font has a name. I have to check into that one of these days. The font feels very much like a gotisch (textura) typeface, which is the most calligraphic form of blackletter. Textura fonts were used throughout Europe, including England, Germany, France, and the Netherlands. The font actually feels more "Old English" than Pennsylvania German, because of the design of those capital letters "I" and "J", with those double dorsal fins. Those fins are seldom seen in early Pennsylvania German typography. Although some of those fraktur lowercase letters in that nameplate feel as Pennsylvania German as shoofly pie. This blackletter font feels Pennsylvania / English / Germanic all in the same font. I like it a lot. It has lots of hybrid vigor. P.S. Those horses in the nameplate are the Pennsylvania Seal. And that high-stepping bay mare is an engraved-copper printer's cut. I found her in a flea market. She is out to pasture. Lancater County has always had a refined taste for finely-crafted objects, despite our reputation for being plain and practical. 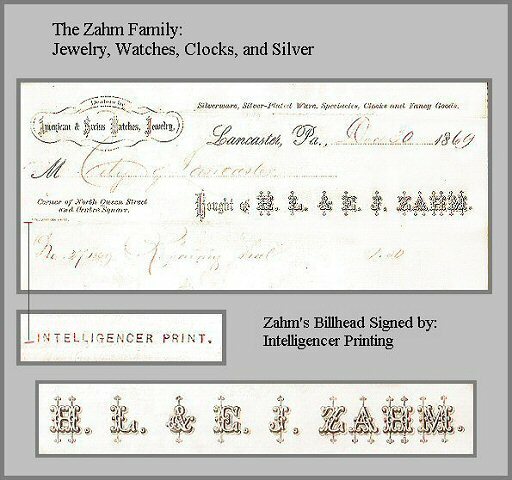 The Zahm store was located in the center of the action, on "Zahm's Corner," home to today's Fulton Bank on Penn Square. Lancaster printers probably did not print the color images on these chromolithograph trade cards (business cards), although they did print the text. Trade cards were all the rage, here, in the last decades of the 19th century. All roads lead to Lancaster's Centre Square (Penn Square) according to the clock by Michael Zahm and John W. Jackson. The clock's painting is based on an illustration in the 1843 book Historical Collections of the State of Pennsylvania, which I show here. Lancaster City has always been the "county seat" of Lancaster County. So, for me, all roads really do lead to Lancaster City, the center of all known galaxies.